You are at:Home»Departments»Rules and Regulations»TWEEEEEEEET! OFFSIDE! If you want to razz the ref when he makes that complicated call, here is everything you need to know so that you sound like an expert. Good luck with that. Only two pieces? How hard can it be? Very! 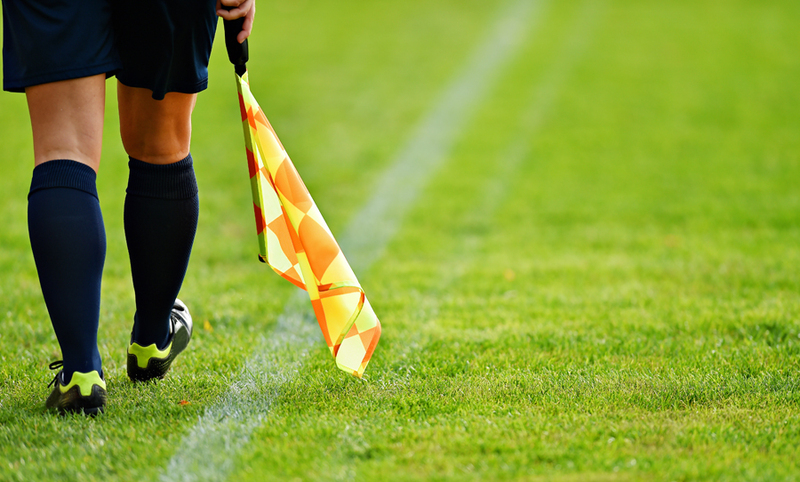 Let’s dig deeper into what is required for an offside infraction. It is not an offense for a player to be in an offside position. A player can be 10, 20 or 30 yards into the opponent’s half, 50 or more yards from the second-last opponent, but until something else happens, we have no infraction. The last opponent is usually the goalkeeper but this might not always be the case. A player cannot be considered in an offside position if they are in their own half of the field. All of these positions relate to where the attacking player was when the ball is last played or touched by a teammate, not when the ball is received. Okay, so that’s position. But what else needs to occur? Let’s explore these requirements in more depth. This means that the player in the offside position plays or touches the ball. If, in the opinion of the referee, no other teammate in an onside position has the opportunity to play the ball, the player in an offside position may be penalized before touching the ball. But, if there are two attacking players chasing the ball, one who was in an onside position and one in an offside position, the assistant referee has to wait and see which player plays the ball first. This means that the player in an offside position prevents an opponent from playing or being able to play the ball by clearly obstructing the opponent’s line of vision. This generally applies to opponent goalkeepers. A player in an offside position can also interfere with an opponent by challenging for the ball. Merely putting an opponent under pressure is enough. No contact with the ball is necessary. Or, by clearly attempting to play a ball which is near to him when this action impacts on an opponent or makes an obvious action which clearly impacts on the ability of an opponent to play the ball. In other words, reduces the options of that opponent, makes him hurry his clearance, etc. A ‘save’ is when a player stops a ball which is going into or very close to the goal with any part of the body except the hands, unless the goalkeeper is within the penalty area. A player in an offside position receiving the ball from an opponent who deliberately plays the ball (except from a deliberate save by any opponent) is NOT considered to have gained an advantage. So, if an attacker passes the ball upfield, and a defender attempts to head the ball but mistimes his jump and the ball goes to an attacker who was in an offside position when the original pass was made, there is no offside offense. Offside position is determined the moment the ball is played. Offside offense is judged when the player becomes involved in active play. The only parts of the body taken into consideration when judging offside are those elements that can legally be used to propel the ball: feet, legs, torso (body), and head. The arms are not considered to be part of the body. This includes the goalkeepers. Andy Moss is a current USSF National Referee coach and a former USSF National Referee. He was born and raised in Manchester, England and is a lifelong Manchester City FC fan.